This post includes an excerpt of the feature article in the May/June/July edition of Wood Bioenergy US (WBUS) written by Brooks Mendell, Ashley Barfield, and Amanda Lang. It is the second part of a two part series on liquid biofuels. 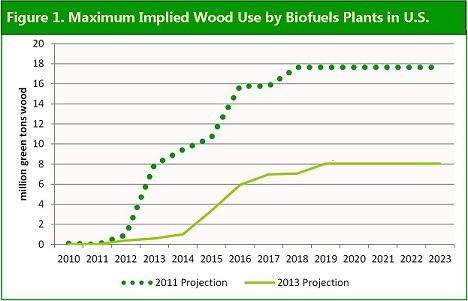 WBUS Market Update: As of July 2013, WBUS counts 459 announced and operating wood bioenergy projects in the U.S. with total, potential wood use of 128.6 million tons per year by 2023. Based on Forisk analysis, 296 projects representing potential wood use of 78.5 million tons per year pass basic viability screening. To download the free WBUS summary, click here. This post includes an excerpt of the research in the February/March/April edition of Wood Bioenergy US (WBUS) and is the first part of a two part series on liquid biofuels. In May 2011, Forisk and the Schiamberg Group evaluated the viability of 36 wood biofuel projects in the United States. The study emphasized the unlikely and problematic development of the wood biofuels sector while singling out projects with drop-in fuels and specific technology types as having investment potential for investors. As of April 2013, 13 of the original 36 projects have been cancelled and 12 remain in the planning or construction stages. Four have been shut down. Since the 2011 study, ten new wood biofuel projects have been announced. New projects emphasize feedstock flexibility beyond wood raw materials and focus on multiple, existing end markets including diesel, sugars and industrial chemicals. Analysis of potential wood use highlights the minimal relevance of the biofuels projects to timberland investors in the U.S. today and over the next ten years (Figure 1). Newly announced wood biofuel projects have become increasingly less ambitious and less relevant to forest industry firms and timberland investors. Analysis comparing projects in 2013 to those from 2011 find that current projects use less wood and scale at smaller production levels. Meanwhile, the traditional forest products industry is reopening closed plants and building new capacity in response to increasing housing demand. In the bioenergy sector, wood pellets provide a ready, realizable market. The enthusiasm for wood biofuels from a few years ago has been replaced with well-earned skepticism and caution. For timberland investors, potential demand and wood-based revenues from biofuels have been discounted. For traditional forest industry firms, biofuel worries have been replaced by demands to be treated fairly in legislation or mandates that could affect wood raw material costs. And for biofuel investors and project developers, the needs to produce product for existing markets that can produce cash today have strengthened business models and modified expectations for potential growth in the next five years. WBUS Market Update: As of April 2013, WBUS counts 456 announced and operating wood bioenergy projects in the U.S. with total, potential wood use of 125.0 million tons per year by 2023. Based on Forisk analysis, 293 projects representing potential wood use of 75.4 million tons per year pass basic viability screening. To download the free WBUS summary, click here. As a group, they own/manage 86.2 million acres of timberland. On average, they own/manage 736,589 acres of timberland. The median ownership is 312,000 acres. Assuming an average per acre value of $1,500, each firm owns or manages on average $1.1 billion in timberland assets. Analysis of private timberland in the U.S. affirms the concentrated nature of large ownerships. While U.S. Forest Service research by Brett Butler concludes that 10 million family forest owners account for 264 million acres (35%) of U.S. forestland, Forisk research indicates that the 286 largest owners alone account for 92.1 million acres. Each of the top ten own or manage in excess of 2 million acres. For detailed data on US timberland ownership and more information on Forisk’s 2013 US Timberland Owner List, click here. Through executing the Louisiana Purchase in 1803, President Thomas Jefferson proved himself, among other things, the preeminent timberland acquisition professional. In this bold embrace, he more than doubled the size of the United States by acquiring 820,000 square miles of land west of the Mississippi from France for $15 million dollars. That equals 524.8 million acres at 2.9 cents per acre (or just over 50 cents per acre in today’s dollars). The Louisiana Purchase was opportunistic. U.S. negotiators wanted to buy New Orleans, but Napoleon needed financing to wage war on England. So he rejected the New Orleans proposal and countered with a deal to sell all of France’s North American land holdings. The U.S. team, led by Secretary of State James Madison, took the offer and closed the transaction. Bada bing, bada boom. Forisk’s ongoing research of timberland investment vehicles highlights how private timberland owners and ownership have changed over time since the days of powdered wigs. Today, timberland investment professionals scour the landscape and courthouse documents for the next purchase in Louisiana or in Arkansas or in Texas. As of 2013, Forisk counts 217 owners that each own and manage 25,000 acres or more for a total of ~91 million acres of private timberlands. Of these acres, 18% are owned by the four public timber REITs (Plum Creek, Potlatch, Rayonier and Weyerhaeuser). Want a simple method for valuing stocks and income earning real estate or timberland? Consider the Dividend Discount Model by dividing next year’s income, assuming it will be earned annually in perpetuity, by a constant discount rate or cost of equity. For example, assume that Forisk stock pays $1.00 per share annually in perpetuity. How much would you be willing to pay per share if you required a 10% rate of return? According to the Dividend Discount Model, you would pay $10 per share. If we think about this model with forestry investments in mind, assume a timberland ownership generates $100 of net income per acre per year. Applying a 6% discount rate in the Dividend Discount Model ($100/6%) gives a valuation of $1,667 per acre. For those of us in timber, we can see that this approach gets us “in the ballpark” and provides a simple approach for “drive-by” valuations…..
Click here to register for “Applied Forest Finance” on February 7th in Atlanta, Georgia. The course details necessary skills and common errors associated with the financial and risk analysis of forestry-related investments. Registration includes copies of our “Forest Finance Simplified” handbook. Forest Finance: When is the “Current Stand Approach” Useful for Valuing Timberlands? When talking about timberland investing while having a beer or standing over the hood of a truck, not when signing checks or allocating capital…..
A reasonable estimate of a forest’s current economic value equals the standing merchantable volume multiplied by the current stumpage prices in the local market. Investors sometimes use this “back-of-the-envelope” technique to estimate the liquidation value of a timberland investment or forest-owning firm. However, this basic approach suffers from observable, value-destroying limitations. Why? It ignores the potential for generating greater wealth by holding the forest to economic maturity, investing in forest management, identifying other revenues, or accounting for taxes or opportunity costs associated with the land and capital. This snapshot value faces other weaknesses. First, current realizable values for the standing timber will be low at any given point in time. Also, for large timberland ownerships or plantations, the local market can rarely absorb a total liquidation (clear cut) of inventory without depressing local prices. From a valuation standpoint, the former incents conservatism and the latter incents unreasonable optimism. Generally, appraisers valuing forests completely avoid current stand valuations (in writing)…..